When the movers & shakers of the gigantic-project world just need something simple, they subscribe to the Enterprise (EPM) plan... but did you know that even smaller players can get into that game? Our Enterprise (EPM) plan is simplicity as you knew it when you were five years old: as easy as building with well-made blocks. And like lego blocks, the best of good ideas fit together perfectly. In this way, members of Business (PMO) plan teams see everything they were doing there, slotted and stacked on top of what another team within the enterprise is doing here or there. In other words, with Enterprise (EPM) plan you can establish teams separated by oceans or as diverse as the fauna swimming within them. For example, have a Compliance Division in the States, a Manufacturing Division in India and a Sales Division in the Philippines? No problem, all your enterprise teams are working from the same portfolio of plans and people, and HQ is tied in as well. Any titan of industry loves thinking of saving money, and we bet you do too. Not to bash the biggies in the PM software-world, but how are constant server updates and ridiculously complex software packages saving anyone any time or money? As SaaS solutions, both these plans are simple to learn, easy to implement and allow team members to easily exchange files with any Microsoft Project user - no transforms, no Excel mapping, no nothing...just point and tap to come up winning - on any device or platform of a user's choosing. In addition, consistency and modularity saves, just ask the folks over at the Department of Defense, who built a new class of Polaris submarines on time and on budget (well, almost). DOD even had competing shipyards collaborating together to make the savings so (see story below). An enterprise configuration "tames the lions" so to speak. You're no young start-up sleeping on couches and out hunting all night, so time for a better "plan." The Enterprise (EPM) plan puts formality into what is often a very large informal workplace, with some towing the line and many just doing their own thing. In other words, the Enterprise (EPM) plan adds a little structure to the bat cave. Just like Business (PMO) plan does, only on a grander, more macro scale. Interested? Then just give us a shout out and we'll hook you up with an enterprise expert who can give you free advice and answer any pre-sales questions you may have about our enterprise solutions - custom built just for you! The development of the USA's Virginia-class nuclear submarine – a collaboration between two fierce competitors (General Dynamics and Newport News Shipbuilding) – is a huge success story (in a book of many failures). This US DOD project produced modernized submarines that cost far less to build and maintain than the previous model then in service (the Seawolf-class submarine). Virginia-class submarines were designed using the then new technology: CAD (computer-aided design), thus eliminating a mountain of paper blueprints usually needed to begin any sub-building project. Resources from two competing companies were contracted in order to cut down on build time – placing them in a very unnatural collaboration. A simulator was built to test the design of crucial command components – before installation on the submarine assembly. The interior of the submarine was built in modular parts (some the size of a small house) that could be slid in and out of the hull later on down the road, thus extending the overall life-expectancy for the class. 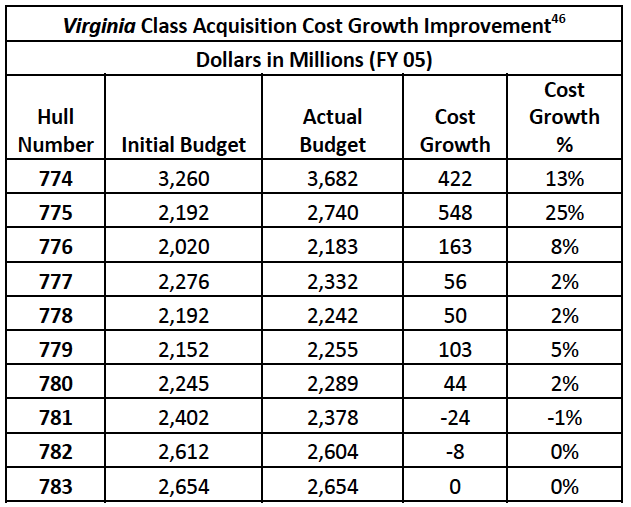 1) Innovations in technology helps any project manager...this was the case for Virginia-class planners, as they knew they needed to use technology innovations to bring their project in under budget, and under the intense political scrutiny of 1990’s defense-budget reviews. So they took a gamble, used new CAD software and went completely paperless for the first time. 2) Innovations in collaboration can turbo-charge project finish-times...as project managers, we are always talking about collaboration (one of the most famous buzzwords of the 21st century), but from what we’ve seen, we rarely innovate in this regard before the start of each new project. When was the last time you had a “collaboration review” before the start of a new project plan? We did, as we developed our revolutionary real-time collaboration (rTc) technology, we followed the Navy’s lead in placing a high priority on improving collaborations between project administrators, managers, workers, stakeholders and other collaborators. That’s what the US Navy did when rolling out the Virginia-class project, and they shaved years off delivery times. 3) Innovative modular designs can save you time and money...we tend to think of modularization as something that happens during a manufacturing process, as when building “plug and play" parts for phones or cars. But we build software and offer plans in a modular fashion as well. Case in point, all Business (PMO) plans and Enterprise (EPM) plans can be assembled in a modular way, akin to how the Master Project / Subproject feature of MS Project works. That’s what the Navy did with a submarine, so surely we want to do that in our own work. The end result is less time spent reworking old plans to fit new projects; in short, we’ll can all just save a ton of money that way. 4) Innovating with simulations can make projects more risk-resistant…the Virginia-class engineers knew they had no time to design components that would later have to be redesigned because they didn’t quite work when actually installed in the final product. So they built a simulator to test critical component-designs before actually putting them into action. One can think of Project Plan 365 apps as potential simulators, only instead of simulating buoyancy, we plug in data that simulates project work (a what-if scenario). Just change pre-baseline values to model unexpected changes in resource allocations, schedules or budget, then include that knowledge in your Risk Management Plan. 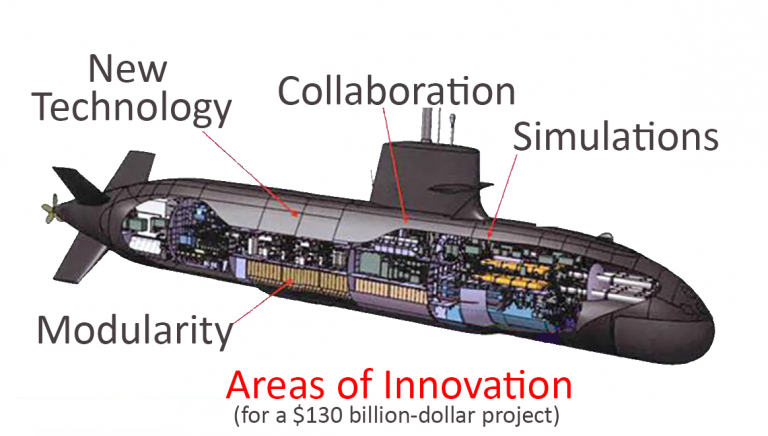 So you’re not planning on building a nuclear submarine anytime soon…but by using innovative and new Project Plan 365 features, and innovating your own use of new collaboration techniques, modular plan designs and simulations, you too can roll out projects as successful as the Virginia-class nuclear submarine. Turbocharge your enterprise plans by using one of ours: Individual (PM), Business (PMO) and Enterprise (EPM) subscription plans are available here.